Cradled in BC’s legendary Selkirk Mountains, renowned for epic winters, Whitewater’s dependable dry snowfall totals over 12 meters a season. That’s close to 40 feet. And there’s more. Factor in the 5,400ft/ 1,640m base elevation and the 2,044ft/ 623m vertical drop and you have one memorable ski experience. Whether you choose to experience the new Glory Ridge chair or the originals Summit andSilver King, you will not be disappointed at Whitewater Ski Resort! Whitewaters Mountain Tours are a great way to see the mountain and learn about navigating around the terrain while learning about the various services that Whitewater offers. For those looking for a different style of skiing, Whitewater Ski Resort also offers 13km of Nordic Trails. from whitewater ski resort website. Climb to the summit of Half Dome, or the notch between Ymir Peak and Half Dome and descend into Kututle forever. There are tons of lines out here and a more wilderness feel than any of the other touring areas around Whitewater. Location: Whitewater Ski Area. Purchase a single ridge ticket and ride the Summit Chair. From the top of the Summit Chair ski left along the run on the top of the ridge. Stop at the top of Motherlode and look for the Ski Patrol Warning Sign in the little dip before the traverse. The route stays closely on the ridge and is used by the Ski Patrol as a safe route to the top of their blasting run during high avalanche conditions. After numerous tight switchbacks the top of the ridge is gained. A steep tree glade named “Garbage Chutes” is an exciting descent next to the route of ascent. There are a series of progressively steeper lines ( N facing ) that continue for the next kilometer along this ridge. The trip out to Sherpa Valley takes the flat ridge to the South with cliffs lining the right hand side. After five hundred meters you will break into a small bowl, known as Sherpa Valley. If you would continue further along the ridge you end up dropping down very low km7 on the access road and Mama and Papa Bear Chutes are down that way too. Alternatively traversing left above the ski area takes you to Prospector Bowl which has some amazing steep lines leading back into the ski area. Climbing further past from Prospector’s takes you into the entrance for West Ymir and continuing on from there takes you to the summit of Ymir Peak along with the south facing lines H8 and the south face of Ymir Peak. 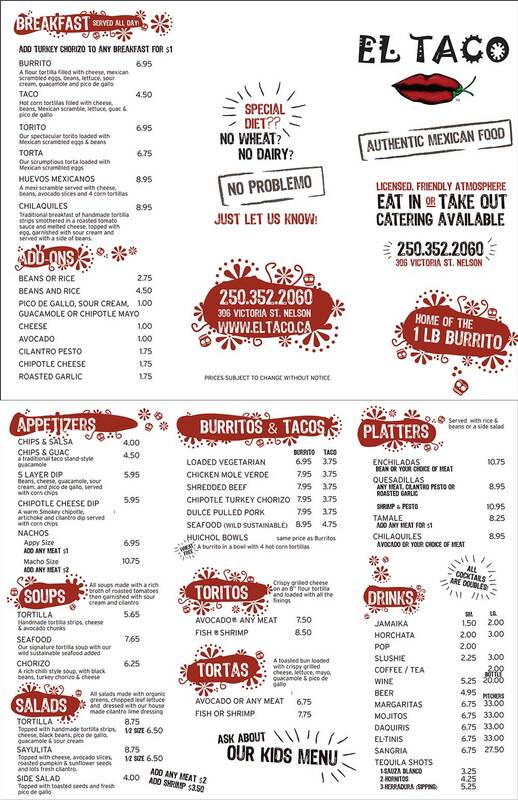 A number of options are available to gain access to Ymir Bowl and Ymir Peak. The ridge line from Blasters ridge to the summit is the longest route but the most scenic and safest. Alternatively from the White Queen Pass climbing up the ridge and traversing high under the rocks over steep terrain and gaining the ridge. The ridgetop is called Half Dome and good runs can be made form here into Five Mile. From just below the final climb to Half Dome a traverse can be made into Ymir bowl. 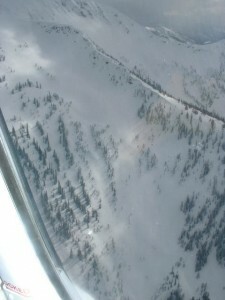 Ymir Bowl is not a good place to be unless Avalanche conditions are very stable. Once in the bowl Kututle Pass is an interesting destination or Ymir Peak can be gained from the bench just to the left of the Peak. The route to and from the Peak involves careful manoeuvring on rocks and snow on the steep East slopes of Ymir Peak. Five Mile Saddle above the lift, Goat’s Slide, Half Dome, Scob’s Knob ( the treed knob within the bowl ), Kututle Notch, Cookie Cliffs, Kuba Chute, Ymir Peak, Dogs Leg, First Choice, Pencil Chute, West Ymir, and Prospector’s Bowl at the edge of the ski area. Location: Whitewater Ski Area. Skin to the top of Yankee Girl. 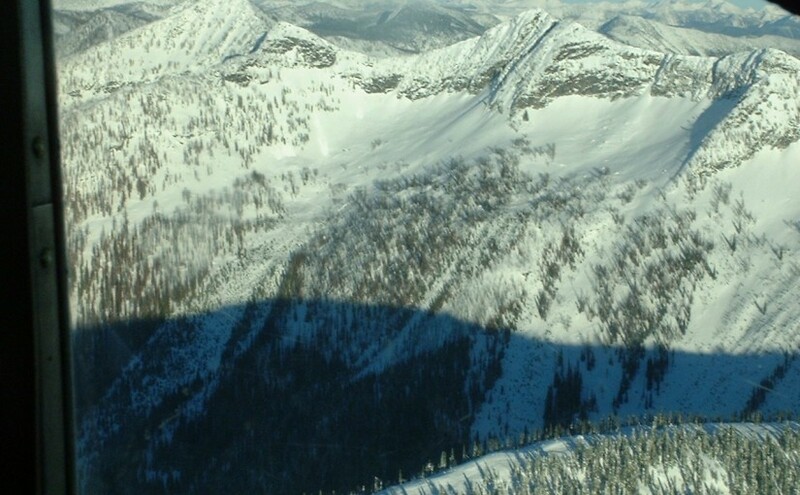 from helicopter with Ymir Bowl in background, Half-Dome out of view on top left and the Five Mile Ridge on right hand side typically where skiers emerge from the climb from Whitewater Ski Area. From the top of the Yankee Girl ski run proceed outside the Ski Area, zigzagging directly upwards to gain the pass ( 15-20 minutes ). 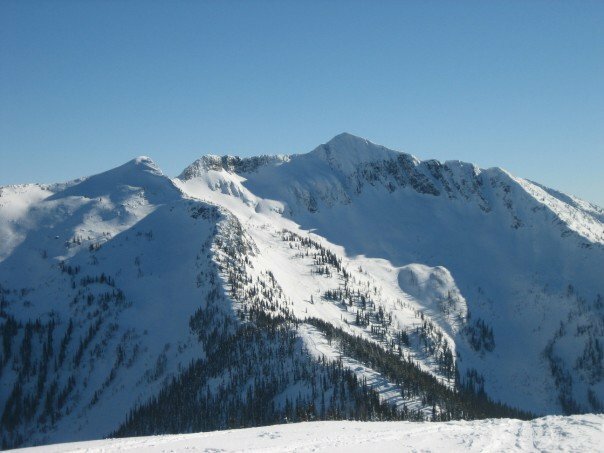 The ridge is narrow and offers spectacular views into Five Mile and of Ymir Bowl/Peak. From here steep descents can be made into Five Mile Basin. To go to White Queen summit turn away from Ymir Peak and head NW ( left ) along the ridge. To climb to the summit of Half Dome climb the ridge ( right ) for awesome runs of around 1500 ft. Traversing into Ymir Bowl is also popular from mid-way on the Half Dome ascent. The far side of Five Mile Bowl offers a further set of adventures with steep climbing, steep skiing and perfect north-west facing powder. The best way out of Five Mile is by climbing and traversing down the valley through the trees and gaining the White Queen Ridge. Great runs from here on steep West facing slopes down to the Ski Area Access Road. The back side of White Queen is N and NE facing and has become known as Black Queen and has some of the best tree skiing around Whitewater. Location: 2 Km beforeWhitewater Ski Area at KM 10.5 Parking Area. Park your vehicle in a small turnout at the big bend about 8 kilometers on the Whitewater Ski Area road. 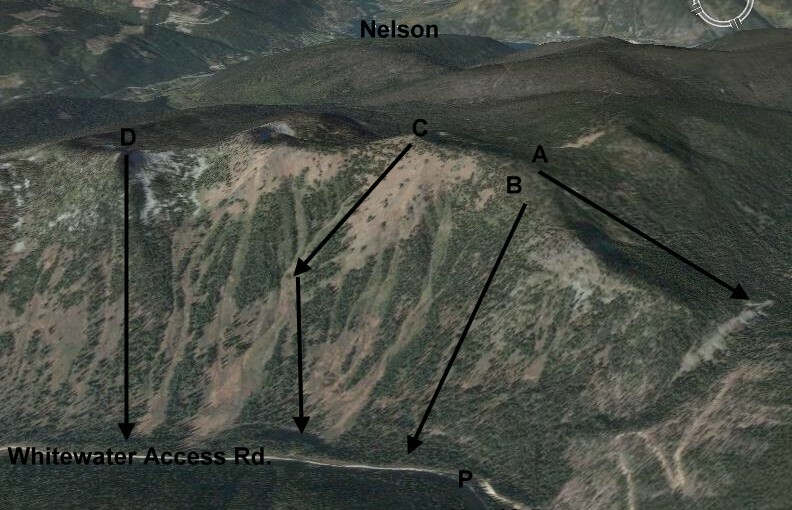 Find the logging road that heads down to Apex creek in an upstream direction. Whitewater has created cross country ski trails in this region and so the ski touring access is a matter of following the trails into the drainage. Easiest to take the right hand side of the creek and take the ridge on the right of the creek and when the road crosses the creek again leave the road and follow the creek directly up through Hummingbird Pass. To access Evening Ridge continue all the way through the pass, just before descending, traverse back left, quickly ascending through open trees to gain the ridge above the Pass. Continue up the ridge as far as you desire, with beautiful views of Ymir Peak and the Kokanne Group. Another reasonable and fast possibility includes climbing up descent line B. The descent route is either down the ascent route, or down various lines on the East face. 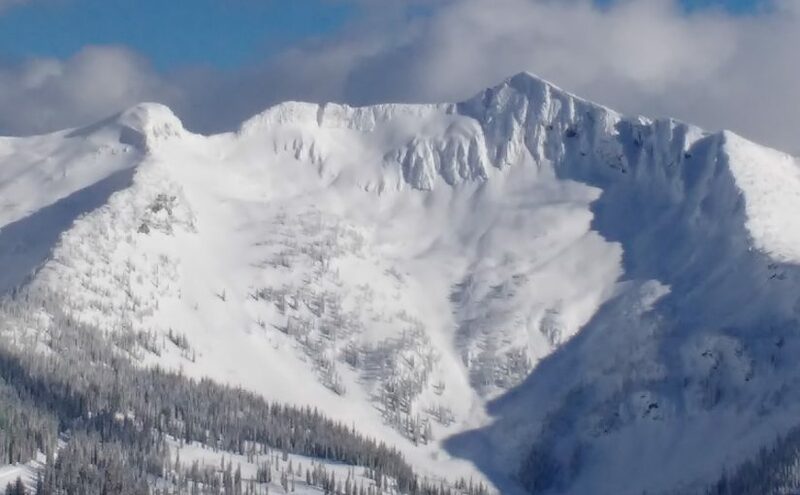 There are several major avalanche slopes and very steep avalanche prone slopes on this face, and require good navigation skills and good stability assessment. Run C called Whale’s back, generally wind affected on the top and sun affected on the lower slopes unless your timing is right.